Not really but it's funny anyway. Is it ok to go for tanyao/pinfu/riichi/tsumo all the time? It didn't work out unfortunately but thanks anyway. That was what I ended up with on the first hand of a game on the 4th turn, discards weren't very relevant. Tried for sanshoku but it didn't turn out and I got ron'd with a trash hand anyway. Topic: How often do you get tenpai? Re: How often do you get tenpai? How often do you get tenpai? This is my third one ever. 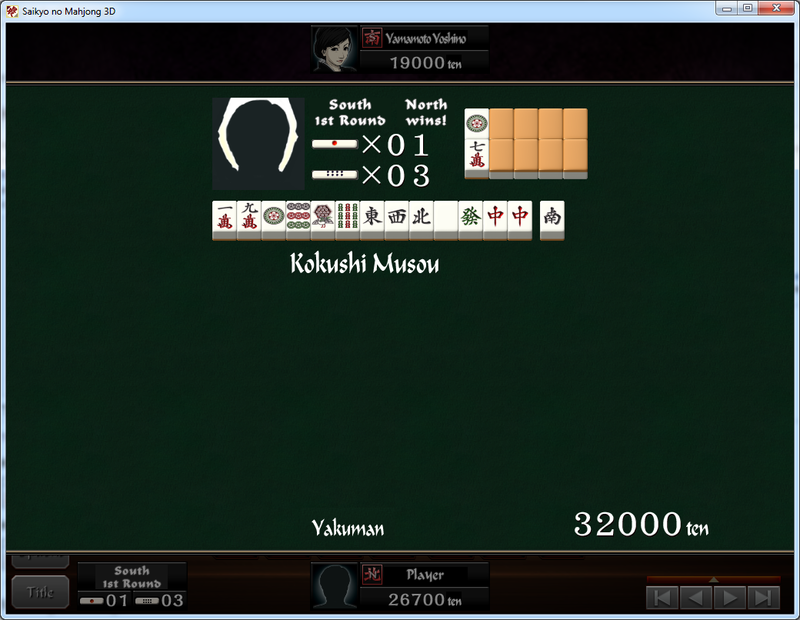 Barticle wrote: Koizumi would just use his Goumoupai ability to abrade the sevens to make white drags for the yakuman. Haha true... if he actually managed to get a hand that wasn't a Rising Sun. I once had a daisuushii where I pon'd three different sets of winds and ron'd the last set. It was against computers but you'd think they would know to stop discarding winds at some point. I also had similar with a daisangen.